You've perfected the frosting on your jumbo cupcakes. Now you just need packaging that keeps these cupcakes looking great. 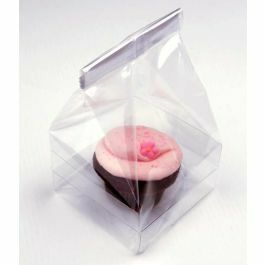 Our CBG3 cupcake bag set is ideal for holding a single jumbo cupcake. 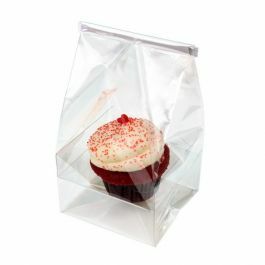 The set includes a 4" x 4" x 9" flat bottom gusset bag and clear plastic tray insert. 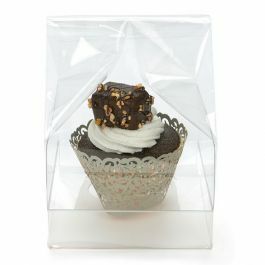 This packaging is designed to support top-heavy layers of frosting and added decorations. 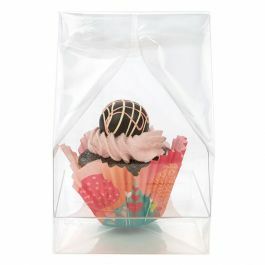 The plastic tray provides a sturdy base while the lunch sack style bag has expanding side gussets so your frosting stays intact. To use the insert, fold the long tabs up and place on the sides of the bag to keep gusset from touching contents. Fold the short tabs down and place on the front and back of the bag. The 1.6 mil thick material is made of high clarity BOPP for an exceptional presentation. Food safe and heat sealable. Clear stickers are included for a tamper-proof seal. The primary use for CBG3 is for holding a single jumbo cupcake or muffin.